After successfully operating since 1979, Germany’s second largest airline, Air Berlin, went bust one year ago today. Following Air Berlin’s bankruptcy, things have changed – a lot – in the German aviation industry. Not just because of the fact that 132 airplanes and more than 8000 employees were forced to move airlines. But before we get into what has changed – and why, let’s first take a look at the airline, its history and how it all came to an end. 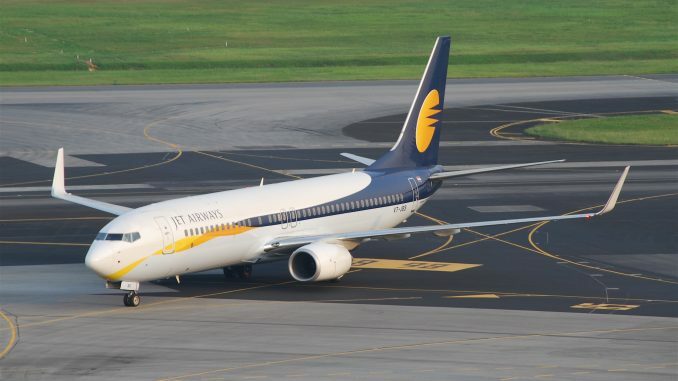 Founded it 1978, started operations in 1978; it was operating for almost 39 years when its last ever commercial flights were in the air on October 27th, 2017. Air Berlin was originally created as an American charter airline (called ‘Air Berlin USA’), to operate flights from West-Berlin to holiday destinations. Because at that time, German airlines weren’t allowed to operate flights to or from Berlin Tegel. This privilege was exclusively granted to airlines from the United States, the United Kingdom and France. Therefore, carriers such as Pan American World Airways, British Airways (later Deutsche BA – ‘German BA’), Air France – and Air Berlin USA – were Berlin’s largest passenger airlines until restrictions were lifted in 1990. After the reunification of Germany, Air Berlin USA was bought by investor Joachim Hunold in 1991, who transformed the airline into a German company and stayed CEO of ‘Air Berlin PLC & Co. Luftverkehrs KG’ until 2011. 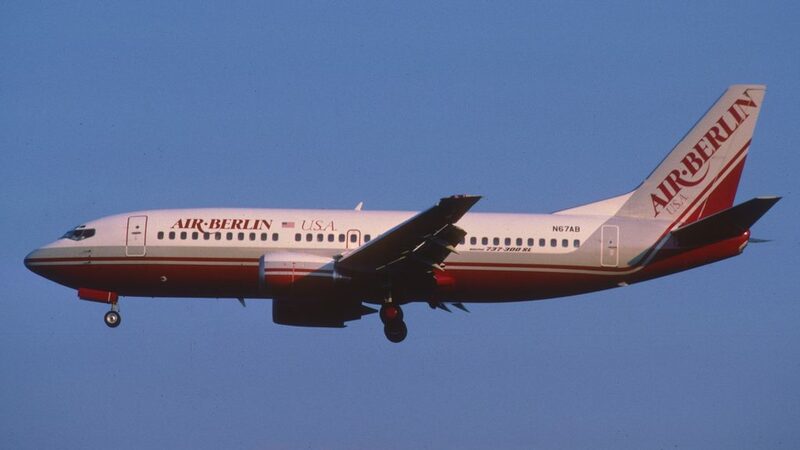 In 1998, Air Berlin received its first of 40 ordered Boeing 737 Next Generation aircraft. The airline was the first ever customer of Boeing’s new winglet on the 737. 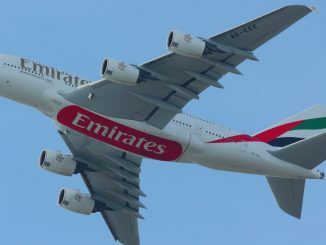 It ordered another 75 aircraft of the same type in 2006. It acquired British Airways owned dba (formerly Deutsche BA) in the same year. Air Berlin’s big expansion plans were turned into a reality when it took over Dusseldorf-based leisure carrier LTU in March 2007, making it the fourth largest airline group in Europe. 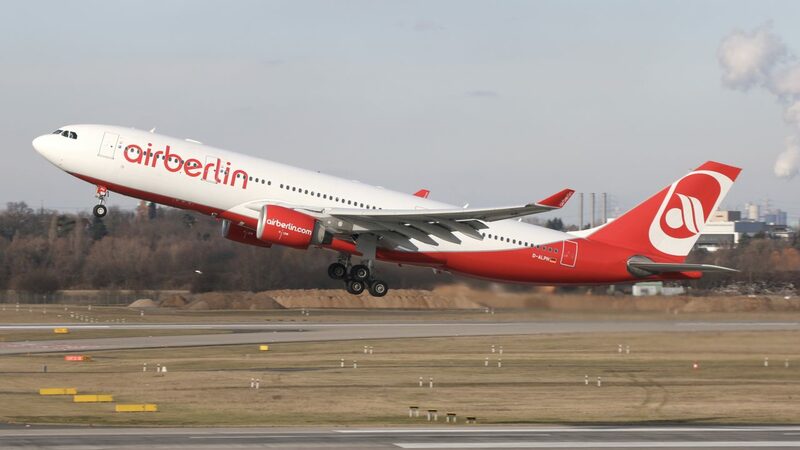 Thanks to this take over, Air Berlin was now operating long haul flights with its newly acquired Airbus A330s. Just four months later, the airline placed an order for 28 Boeing 787 Dreamliner with 25 more purchase rights. The order was cancelled in 2014, due to financial reasons. Ten years before its shut down, Air Berlin was operating almost 100 aircraft. Air Berlin’s fleet in selected years, each year displays fleet as of August. Data from Planespotters.net. Also in 2007, the airline intended to merge with yet another competitor, this time it was going to be Thomas Cook owned Condor. These plans were scrapped in 2008, when Air Berlin instead announced it was in talks to take over TUI fly. Another plan that was never carried out. But Air Berlin and TUI still signed a long-term strategic partnership agreement. Air Berlin, Germany’s second largest airline, had a fleet of 170 aircraft, when it joined the OneWorld alliance in 2010. It purchased 50.01% of the Austrian airline Niki (founded in 2003 by Niki Lauda) in November 2011. In the same year, Etihad Airways Group extended its share in the German company from 2.99% to 29.1%, giving it access to Air Berlin’s European route network. In the 2010s, mainline Air Berlin, which was operating a mixed fleet of 737s and Airbus A320s, decided to move towards an all-Airbus short and medium haul fleet. As of September 2017, there were only 13 remaining Boeing 737 in Air Berlin’s fleet, all of them operated by partner TUI fly Germany. Sadly, the shut down wasn’t unexpected. After struggling for several years, the airline was forced to file for insolvency on August 15th, 2017, when its largest investor, Etihad Airways Group, pulled out. 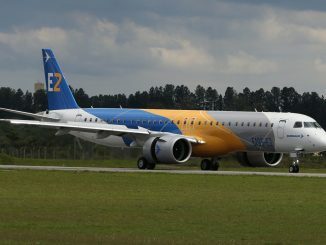 It received a controversial 150 million Euro loan from the German government, which made it possible for the airline to operate until the end of October. With this loan, the government was trying to keep Air Berlin alive until buyers for most assets, including more than 8000 employees, could be found. That plan didn’t quite work out due to a very chaotic back and forth in the take over talks. Ryanair even sued the German government over this transitional loan, but the EU commission later dismissed complains made by the low-cost carrier. If you booked a flight with Air Berlin in 2016 or 2017, there was a possibility that you wouldn’t even fly with the airline itself. Thanks to a failed management, Air Berlin was not able to operate large parts of its network by itself. Therefore, many flights were operated by wet-leased aircraft from other airlines, including TUI fly Germany (which was, in fact, a long time operator of 737s for Air Berlin), Alitalia, Air Serbia, Wamos Air, HiFly and many more. In the last two years before its shut down, it was very clear to everyone looking at the airline industry, that Air Berlin was in a very chaotic situation. The carrier had a negative income of almost 800 million Euro in 2016. Shortly before the end of Air Berlin’s operations, an A320 was grounded at Iceland’s Keflavik Airport due to unpaid airport charges. Since Air Berlin continued to operate more or less after its regular schedule, there were several ‘last flights’. We were very lucky to be on board one of them. 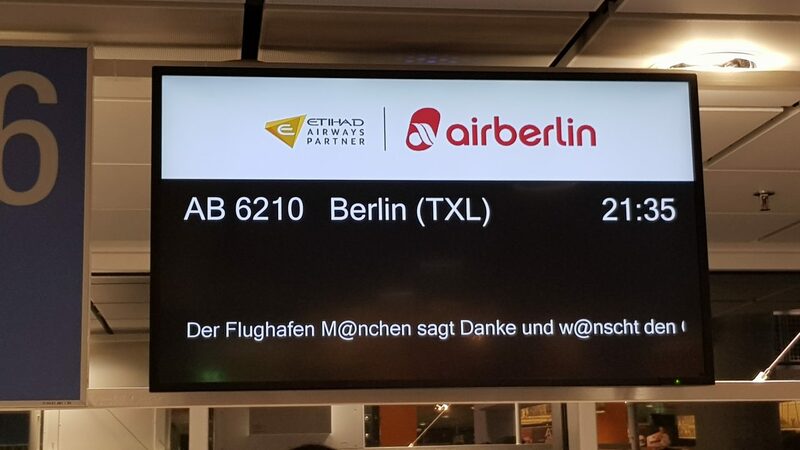 AB6210 – Air Berlin’s last flight to its home base Berlin Tegel Airport (TXL) was operating from Munich Airport to Berlin under the unique callsign ‘BER4EVR’, which also became the social media hashtag for people wishing Air Berlin a goodbye. The flight touched down at 11:45 pm local time. It received an emotional double water salute and was met by thousands of employees and airport workers on arrival. The final flight to Dusseldorf Airport (DUS), Air Berlin’s second hub, was AB8719 from Rome (FCO). It arrived just a few minutes before the very last flight to Berlin. Both flights were booked out completely. Despite operating until October 27th, Air Berlin’s long haul services had already ended on October 16th, when flight AB7001 from Miami, Florida arrived at Dusseldorf Airport. It performed a spectacular go-around on landing that went so far, it had to be investigated by the Luftfahrt Bundesamt (LBA) – Germany’s aviation administration. The aircraft (D-ABXA) flew 15 metres above the runway before turning left and flying over the terminal complex at an altitude of just 30 metres, data from Flightradar24 showed. According to the German cockpit association, the pilots informed the passengers before landing and coordinated to maneuver with the airport tower at all times. Who would take over Air Berlin? 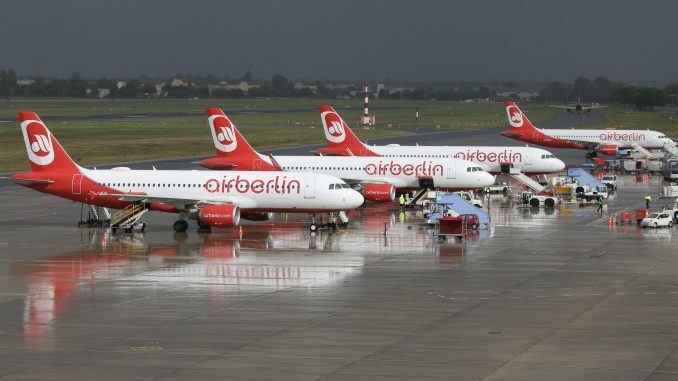 After the airline shut down, large numbers of non-operational passenger aircraft had to be stored somewhere until they found buyers or lessees, as Air Berlin’s entire fleet was leased. 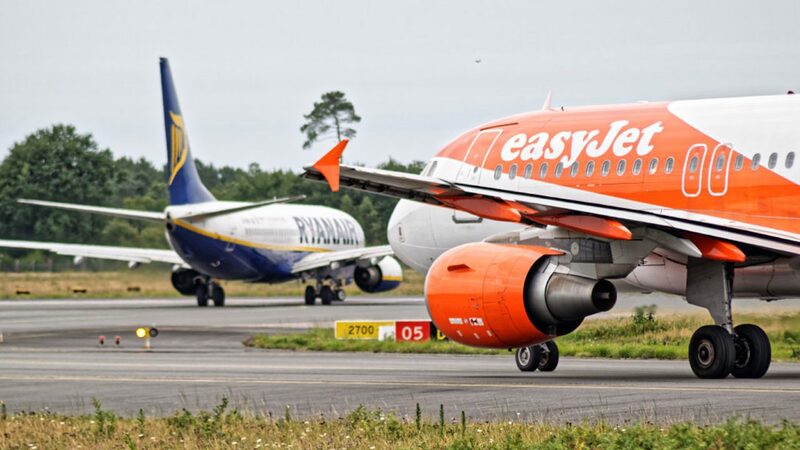 Several European airlines (including Lufthansa, Ryanair, easyJet and Thomas Cook) were originally interested in taking over some parts of the former airline. Ryanair later withdrew its bid for assets of Air Berlin. On October 12th, it was announced that Lufthansa Group will take over 81 Air Berlin Group aircraft for 210 million Euro. These 81 aircraft included the entire fleets of Air Berlin’s subsidiaries Niki and Luftfahrtgesellschaft Walter (LGW). The German flag carrier would invest another 1.5 billion Euro into the airline’s assets. Lufthansa’s acquisition of LGW was approved by the EU Commission on December 21st. Walter was operating 20 Bombardier Dash 8 Q400 for Air Berlin. 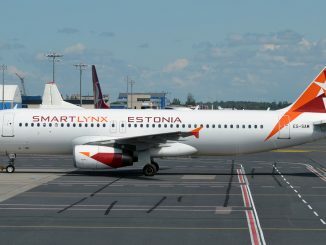 After the fall of its parent company, it started operating most of its fleet on flights for low-cost carrier and Lufthansa subsidiary Eurowings right away. Today, the regional airline is operating both Dash 8, as well as Airbus A319 and A320 on behalf of Eurowings. In January 2018, LGW’s aircraft were re-branded to fit in with its parent company. Following Air Berlin’s end of operations, British low-cost carrier EasyJet set up a new hub at Berlin Tegel Airport. 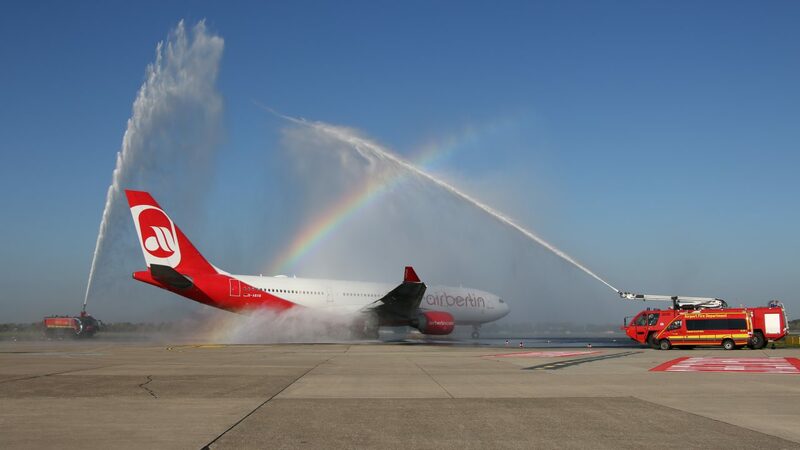 It started flights from the airport on January 7th this year, using wet-leased airplanes in the beginning, until it was able to operate all routes on its own, by taking over 25 Airbus A320 family aircraft and around 1000 employees from Air Berlin. Before, EasyJet was only serving Berlin Schönefeld Airport. The airline now aims to become the largest short and medium haul carrier at both Berlin airports. Nine A320 and A321 aircraft of Air Berlin’s former Austrian leisure subsidiary Niki, which ceased operations on December 13th, are currently flying for Ryanair-owned Laudamotion. 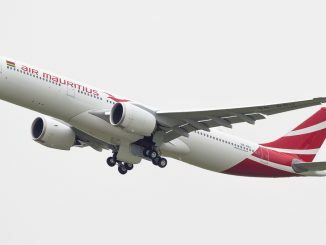 But since these aircraft are leased from Lufthansa Group, Laudamotion ordered 18 new aircraft to replace and expand its current fleet. The airline accused Lufthansa of unfair leasing fees. Air Berlin’s most valuable flying assets, 17 Airbus A330s, found potential new customers right away. Virgin Atlantic was quick to lease four Airbus A330-200, as a temporary replacement for its broken Boeing 787 Dreamliners. Several other airlines later took over one or more A330s as well. These include Malaysia Airlines (six aircraft), Aigle Azur (2), Wamos Air (2), I-Fly (1) and Evelop Airlines (1). Only one former Air Berlin A330 is still in storage, looking for a new operator. Competing airlines rushed to offer new flights from Berlin Tegel and Dusseldorf airports, once Air Berlin was no longer. Thanks to the capacity gaps, Lufthansa, Swiss and Austrian Airlines even used wide body aircraft (including Airbus A340, Boeing 747 and 777) on short haul flights to Berlin in November and December last year. While most short and medium haul routes were quickly taken over by rival airlines, long haul routes weren’t. Air Berlin used to operate a number of transatlantic flights to the US and Caribbean from Dusseldorf and Berlin. 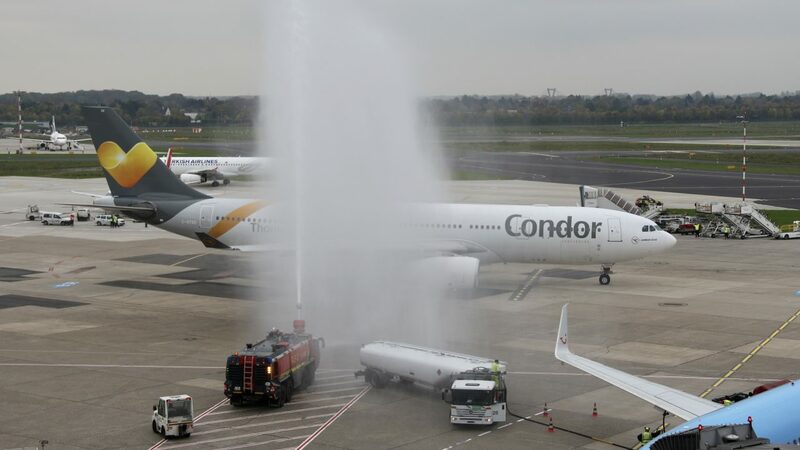 Although Eurowings (operated by Brussels Airlines) and Thomas Cook owned Condor opened up a few new long haul routes from Dusseldorf Airport, there are still missing connections, especially from Berlin Tegel. The capital airport is constantly struggling to attract intercontinental flights. Lufthansa briefly launched a Berlin to New York JFK route, operated five times a week using an A330-300, but already suspended the service again in March 2018. Meanwhile, Eurowings intends to move all of its Cologne based long haul routes to Dusseldorf and Munich Airport until the beginning of next year’s summer flight plan. Air Berlin wasn’t a low-cost carrier. While yes, Air Berlin was below Lufthansa’s quality level, but there always was a huge difference between Air Berlin and competing low-cost airlines. If you look at Berlin Tegel’s situation in 2016, you can see that Air Berlin was clearly the leading operator at the capital airport of Germany. With the exception of some (mostly domestic) Eurowings and Germanwings flights, there weren’t really any low-cost carriers at the airport. Compare that to the current situation: Eurowings and EasyJet are Tegel’s largest airlines. The airport is also a base of Laudamotion, a Ryanair-owned low-cost carrier, which was founded by Niki Lauda earlier this year. And Ryanair itself recently announced that it will open a new hub in Tegel. Berlin has two airports: Tegel and Schönefeld. At least until a miracle happens and the never opening BER actually ends up opening one day and replaces both of them. One year ago, Schönefeld was Berlin’s low-cost airport, hosting airlines such as Ryanair, EasyJet and Wizz Air, while Tegel was an actual hub airport with full-service carriers. You can compare this to London: Tegel is basically Heathrow and City combined (obviously not capacity-wise), while Schönefeld is similar to Stansted or Luton Airport. Today, both airports are low-cost hubs. Which means that if you are looking for an airport with full-service airlines and not price dumping and strike plagued budget carriers, you should rather avoid Berlin. Dusseldorf had a higher percentage of low-cost airlines than Tegel, when Air Berlin was still operating. Therefore, the situation is less noticeable at Germany’s third largest airport. 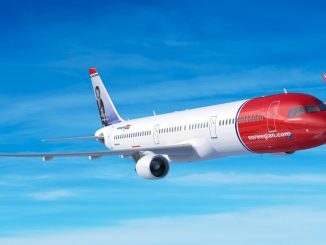 It is nothing new that the European aviation industry is shifting more and more towards low-cost carriers, and the demise of airlines like Air Berlin is only fueling this transformation.